Today is National Chocolate Soufflé Day. I adapted the Bon Appetit recipe for Chocolate Soufflé for Bastille Day this past year. Lovely recipe and very easy. 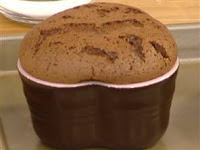 Here's a Link to Dying for Chocolate Bastille Day: Chocolate Souffle´ made in ramekins. Last year Mark Bittman had a Valentine's Day Almost Fool-Proof Chocolate Soufflé. Here's the recipe and a link to the video follows. 1. Heat the oven to 350°F. Butter two 2-cup or one 4-cup soufflé or other deep baking dish(es). Sprinkle each with sugar, invert it, and tap to remove excess sugar. 2. Whisk the egg yolks with the all but 1 tablespoon of sugar until very light and very thick; the mixture will fall in a ribbon from the ends of the beaters when it is ready. Mix in the melted chocolate until well combined; set aside. 3. Beat the egg whites with the salt and tartar until they hold soft peaks; continue to beat, gradually adding the remaining tablespoon of sugar, until they are very stiff and glossy. Stir a good spoonful of the whites thoroughly into the egg yolk mixture to lighten it; then fold in the remaining whites, using a rubber spatula. Transfer to the prepared soufflé dishes (at this point you can cover and refrigerate the soufflés until you're ready to bake them). 4. Bake until the center is nearly set, 20 minutes for individual soufflés and 25 to 35 for a single large soufflé. Serve immediately. Have a great Chocolate Soufflé Day Today!